When NVIDIA debuted video cards featuring its powerful Kepler architecture earlier this year, PC gamers around the world stood up and cheered. Then they got quiet when they realized their only options were the $500+ GTX 680 card or the GTX 690, packing dual-Kepler graphics processing units for around $1,000. PC players drooled over these pricey pieces of hardware. Many bit the bullet and bought one or two or three of each. Still others patiently waited for a more affordable option. Well, their wait is over now. The GeForce GTX 660 Ti is now available for an incredibly reasonable $299. That relatively modest amount of cash will secure gamers a card featuring all the bells and whistles that make the Kepler tech so damn impressive. It's power efficient, its lightning fast. and it's fully capable of doing amazing things to a game like The Secret World, which utilizes the card's TXAA anti-aliasing process to smooth jagged edges to CGI-film quality. 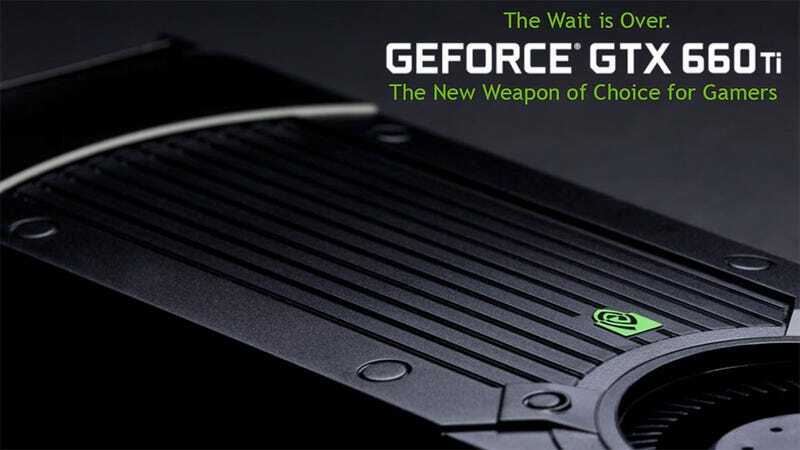 The GeForce GTX 660 Ti is NVIDIA's new flagship graphics card, the one the company expects will become the standard for years to come, offering nearly twice the power of 2010's GTX 470 and 3.3 times that of 2008's GTX 260, both of which are still in heavy rotation in PC gaming circles. To illustrate this point, NVIDIA taps on of the most eagerly-anticipated PC games of the year, Borderlands 2. If a simple FPS comparison chart featuring Borderlands 2 is enough to send you shopping, get this — purchasing the GTX 660 Ti from NVIDIA's online retail partners will score buyers a free copy of the game, giving them something shiny to show off their brand new video card with. The specs aren't as impressive as its more expensive big brothers, of course, but it's more than enough to generate a chart that compares it favorably to the AMD Radeon HD7870. As well as the Radeon HD7950, a card slightly above its pay grade. But these are just slides from a PowerPoint presentation. If you want a true measure of the GTX 660 Ti, slap one in your machine. They should be available all over the damn place today.